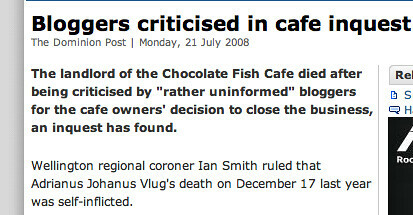 Horrible news from the inquest of Chocolate Fish landlord Adrianus Johanus Vlug, who the coroner found committed suicide after feeling pressure from “rather uninformed bloggers” about the rent increases at the chocolate fish. From that point onward, a series of Facebook blog articles appeared mostly condemning the landlord for having a ‘greedy’ attitude with respect to rent increases,” the inquest found. In its decade of operation, the rent had gone up from “a couple of hundred dollars a week” to $2000 a week, for just 86 square metres. On top of the rental, Mr Wright said the council planned to upgrade the beachside car parks and had told the cafe its share of the costs would be $40,000 to $60,000. The cafe was also paying $18,000 a year to the council to lease the seaside cafe space and the area under the canopy – a charge introduced this year. So the CF cafe faced $180,000 in costs per year, which is a lot for a sleepy cafe that only goes big in the summer. Meanwhile the CF Facebook entry is pretty innocent, but Save the Chocolate Fish Cafe and SAVE CHOCOLATE FISH CAFE!!!!!!!!!!! are a bit less so. Almost all posts merely express regret and nostalgia, and only a few target the landlord or the council – in about equal numbers. (I’m obviously not seeing any deleted posts). There are essentially no new facts introduced – so perhaps the worst posts have indeed been deleted. Those of us who live online know that ranting and trolling is a fact of life – there was, for example, an excellent troll by someone pretending to be the Starbucks head of acquisitions, which a few people fell for. But for the 69 year old owner it all may have come across as personal attacks, and he tragically took his own life. A severe warning for everyone in media – whether informal or formal – to get the facts right and to avoid ad-hominen attacks. My heart goes out to Mr. Vlug’s family. Uh huh! I saw that the other day and had experienced much the same as you – all was being repeated from news sources and focused on the council and the landlords. Crazy how much more important it is now to ensure you get your facts straight so rumours don’t spread out of control. What an awful ending.